They serve this in heaven, I'm sure of it. Got this one from a newspaper a few years ago. 1) Place the mangoes, lime juice and salt in a large saucepan over medium heat and cook, stirring occasionallhy, until the mangoes are very soft, about 5 minutes. 2) Add the sugar and continue cooking, stirring and scraping the bottom of the saucepan, until the mixture becomes syrupy, with a few chunks of mango remaining, about 15 minutes. If the sugar starts to brown, reduce the heat. Let cool to room temperature. 3) Sprinkle the gelatin over 3 tablespoons of cold water and set aside for 5 minutes. 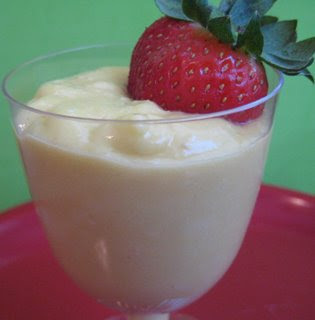 Stir the gelatin into the cooled mango mixture until it dissolves, then mix in the cream. 4) Divide the mixture among 8 4-ounce ramekins or serving bowls. Chill in the refrigerator until set, about 3 hours, and serve cold. Can be refrigerated for up to 1 day.